WHY WAIT?.. GET YOURS TODAY! CUSTOM BUILD THE PERFECT LUXURY PERFORMANCE CENTER CONSOLE TODAY! Blackwater Boats are the epitome of hand crafted perfection. The fit and finish of each Blackwater Boat is impeccable and definitely A LEADER in the industry. Blackwater Boats also offer extreme fuel efficiency making them an even more desirable choice when choosing to build your dream center console. Blackwater Boats are available in 36', 39' and 43' Sport, SportFish and Tournament Edition Models. No matter what your boating desire, Blackwater Boats offers an excellent range of choices from serious tournament fishing to pleasure cruising. Brand new models are in stock now! Simply give us a call to schedule a sea trial so you can learn more about the brand & options. We are experts at listening to our customers needs and then customizing the perfect Blackwater Boat for you! Deep Impact Custom Boats dedication to offering the higher quality custom center consoles is why this manufacturer is so respected in the industry. Deep Impact Boats are known for their style and incredible fit & finish. The lines of each Deep Impact are very distinguishable and each owner takes great pride in custom creating their luxury performance center console to reflect their own personality. Each Deep Impact Boat is extremely unique just like its owner. From mild to wild, the team at Deep Impact Custom Boats will custom create the perfect center console for your boating lifestyle that will turn heads and get noticed at the dock. Deep Impact Custom Boats are also the perfect yacht tender serving as the most elegant accessory to mega yachts around the world. Deep Impact Boats are available in 399 & 360 Sport, Cabin Models. Blackwater Boats has a new center console boat model… The Blackwater 39 Sportfish... and she is a BEAST! The brand new Blackwater Boat 39' Sportfish is the roomiest boat in its class... with an 11' 11" beam, and maximized cockpit space, offering the most interior room of any 39-40 foot center console! Performance proven... the Blackwater 39's step hull yields impressive speed and lower fuel burn. With 740 gallons of usable fuel and an efficient hull, the 39 SF can outdistance the competition. Tall hull sides and bow flare provides for an extremely dry ride when the conditions get rough. Built for the serious angler but comfortable for friends and family. Choose from a wide array of options to custom build the perfect Blackwater 39' Sportfish to suit your boating lifestyle. Custom build yours today! When the going gets rough……you probably won't notice. Thanks to an aggressive bottom design and an overbuilt 18,000 lbs. dry weight hull underneath you, the Blackwater 43 SF carves through the waves and leaves many a lesser boat behind. And not only will the 43 crush the waves, there's more than enough fuel capacity on board to travel as much as 700 statute miles before the need to refuel. Blackwater Boats starts off with a tournament worthy platform and can add as much or as little offshore fishing amenities that even surpass many of the big Sport Fish Yachts. The 43 features two aft 60 gallon lives wells or even a third. There's a custom tackle center and bait prep station behind the helm seats. More than enough fish boxes are found throughout the boat and all the rod holders you need. For those that want to fish, cruise and or entertain, a long list of standards and options is available. There are features such as a dive door, second row seating, over-sized T-top, an electric sun shade, power sun roof, refrigerators, freezer, ice maker, Air conditioning in the cabin and helm station, forward sun lounge and bow seating. The console cabin has over 6' of headroom and offers a large berth, toilet and shower. The list goes on. The oversized center console cabin offers impressive head room. There's a full sized forward berth, sink, head system and options for Air conditioning and A/V equipment. The list goes on but there's more to the Deep Impact 399 Sport boat than style and features. Solid construction provides the ultimate in ride and wave crushing performance. The Deep Impact 399 Sport and 399 Cabin boat is no lightweight and when the seas become a challenge, you'll be confident that your ride will be soft and dry. For those looking for speed, handling and fuel efficiency, the Deep Impacts Custom Boats have always been recognized as a performance leader. With either triples or quads, the Deep Impact 399 will keep you at the front of the pack. Deep Impact Custom Boats are also the perfect yacht tender serving as the most elegant accessory to mega yachts around the world. Deep Impact Boats are available in 39' and 36' Sport & Cabin models. The 399 Cabin is the best combination of an open center console that features a forward cabin for comfortable overnighting. A full V berth, hanging locker, galley and a bonus aft sleeping area come together in air- conditioned comfort. Add to that a separate 6'6" stand up shower and head located in the center console and you have all the cruising features you'll need. What's more is that all of this comes packaged in the look and ride of the re-designed Deep Impact 399. A true offshore thoroughbred built to perform with speed and efficiency. Contact us to build the perfect boat for you. 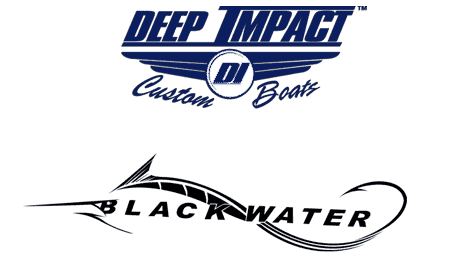 FIND YOUR DREAM BLACKWATER OR DEEP IMPACT BOAT TODAY! At Blackwater Boats and Deep Impact Custom Boats, we strive to provide only the very best in customer service to make sure that have the best possible shopping experience with us and find the boat that is perfect for you! If you have any questions, comments, or need any additional information, please contact us below and we will be in touch with you as soon as possible. Thank you for your interest in Blackwater Boats and Deep Impact Custom Boats! © 2018 BlackWater Boats & Deep Impact Boats. All Rights Reserved.